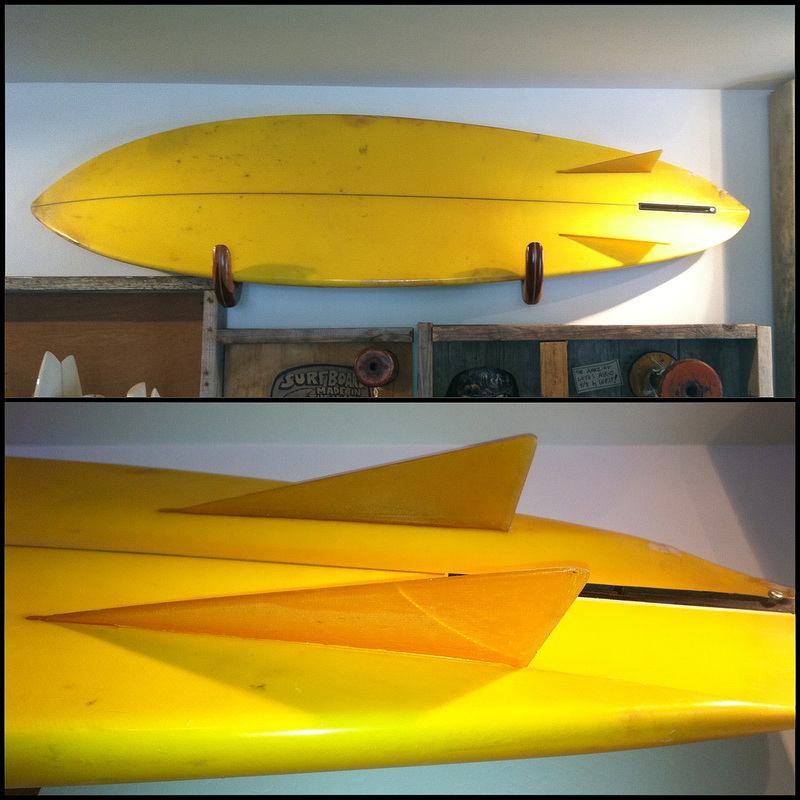 High performance 5 fin Bonzer shortboard shaped by Malcolm Campbell. 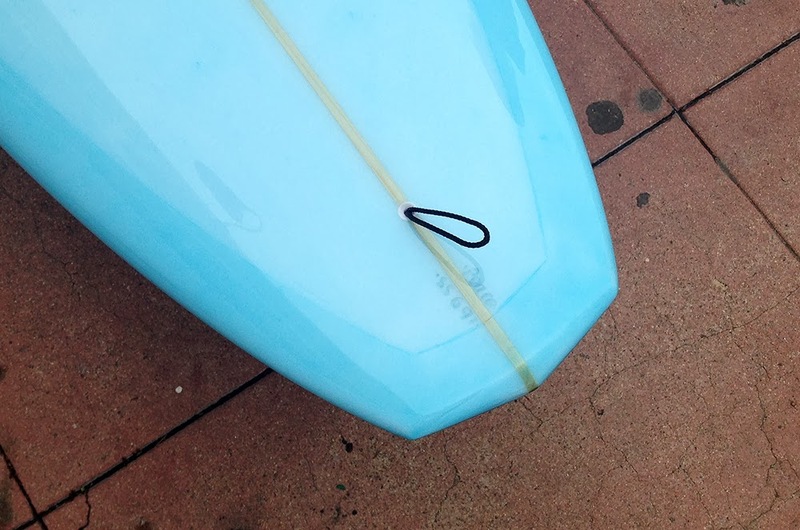 Good for extra fancy surfing. 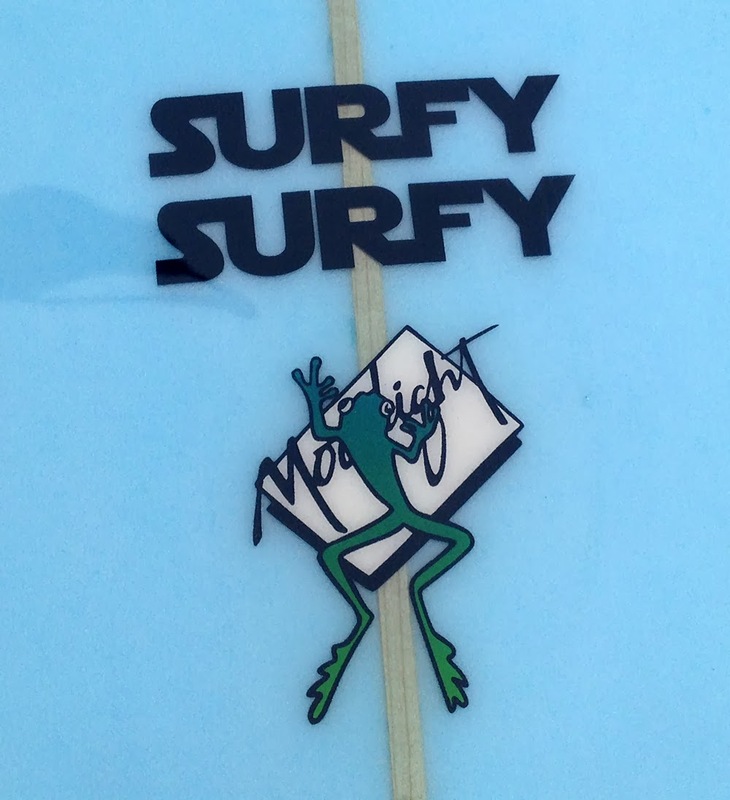 *Campbell Brothers Bonzer surfboards have been the heart and soul of the Surfy Surfy blog. We opened the brick & mortar Surfy Surfy surf shop in 2010, and people are intrigued that we consistently stock and sell so many Bonzers. 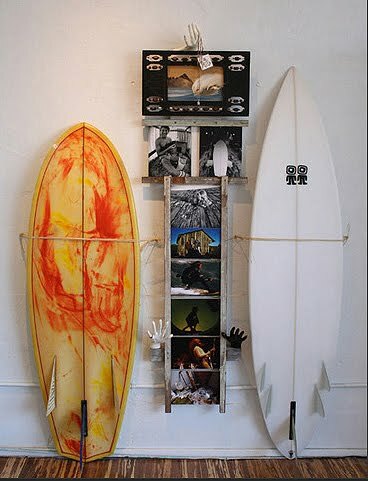 Below is a copy and paste of an interview with Malcolm Campbell from a 2008 issue of Surfing Magazine that answers a lot of questions about our favorite surfboard. SURFING: How long have you been making Bonzers for? 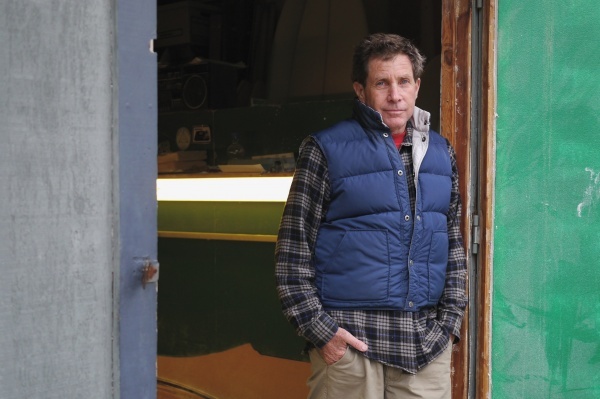 MALCOLM CAMPBELL: Well, the original three-fin Bonzer was December, 1970, and we developed that for a while. The first five-fin Bonzer came out around spring of 1983. The original idea came from some brainstorming between my dad, my brother Duncan and myself. The Australians had knocked board-lengths down to 5’6’ and 5’8”s — they were single fins, of course, and some Corky Carroll twin fins around, too — but the big thing at that point was the really short Australian single fins. But with the boards being so short and wide, you really weren’t getting the drive and the speed that you needed to functionally ride waves with size. My dad’s original thought was why don’t you try three fins. So, we were going through some old books on boats and hydrodynamics and powerboats and what-not and came up with the long, 11-inch keel-shaped fins on the side. And then we worked on it, and got ‘em down to 10 inches, and that’s pretty much been it. 9 3/4 or 10 inches is pretty much it on the three fin Bonzers. The Bonzer design seems to have come in and out of fashion several times throughout surfing history? For the first three years, we were pretty invisible kids living in Oxnard and shaping surfboards. Oxnard was on the fringe of the surfing world at that point and we figured the only way we were going to get any attention for the design — because it was working so well and definitely had value — we sent letters out to the various companies. Bing responded within a week, we went down and showed ‘em our boards and some Super-8 footage. Mike Eaton was the main shaper there, and Mike and Bing both looked at the footage and said, yeah, you can see that the boards worked. So, they went with it, and Bing did a big ad campaign, so for a couple years the boards had a bit more publicity, but it was still a fringe design. After ’78, that was it. We weren’t getting any pictures in the magazines and it was pretty invisible for quite a while. The Thruster came out in ’80 or ’81, and that pretty much buried us…even though it was a three fin board, people weren’t really equating it to what we’d done with the single-to-double concave three-fin stuff. We were pretty much in the shadows until ‘90s, as we were trying to promote the exchange of ideas between shapers, to push things ahead, because things had sort of been a bit stagnant. So, we got a bit of press for that, but it again kinda dropped off the radar until about 2000. Taylor [Knox] and some of the guys started riding the boards, the movie Shelter had a few of the boards in there and that put us back on the radar. And it’s been kind of a slow, organic crawl to visibility. 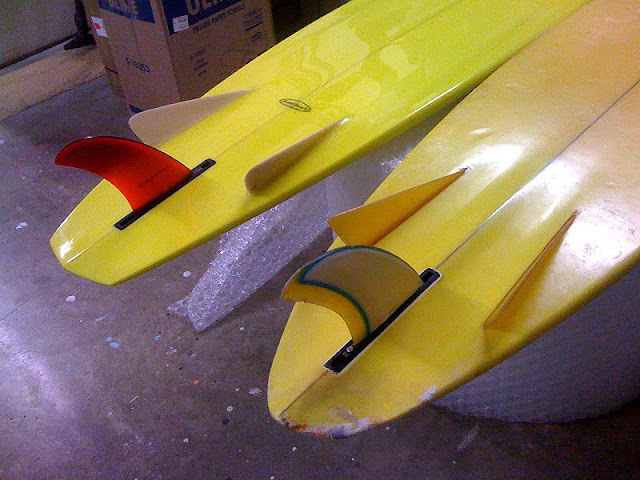 You gotta figure, pretty much anyone 30 or younger has grown up riding the Thruster, so there are a lot of people who don’t really know the work we’ve done with three fins and single- to double-concave designs. There have been a lot of changes in design during all that time — has that affected how you make Bonzers? Fin positions and bottom design essentially is the same since the first single- to double-concave in 1971 — it’s just refined a little. The concaves are shallower, because boards are thinner. You couldn’t put the concave on modern boards because you’d be shaping right through the deck. I’ve heard the bottom called a “Venturi Principle?” Is that accurate? Well, it’s basically like that, but not exactly. What the Venturi Principle is is that water or a gas goes through a wide to a narrow area and back into a wider area, it gains speed because it’s compressed. Like water through a hose: it’s compressed as it goes through the nozzle and comes out at a higher rate than when it went in. That’s basically the Venturi Principle, but technically, since you can’t compress water, it’s not exactly the Venturi Principle. But that’s the idea. We don’t like to talk about that that too much because it became kinda of a buzzword. And to be honest, I get a bit impatient with a lot of the pseudo-scientific psycho-babble that goes on in surfboard building. Surfboards are so funny. 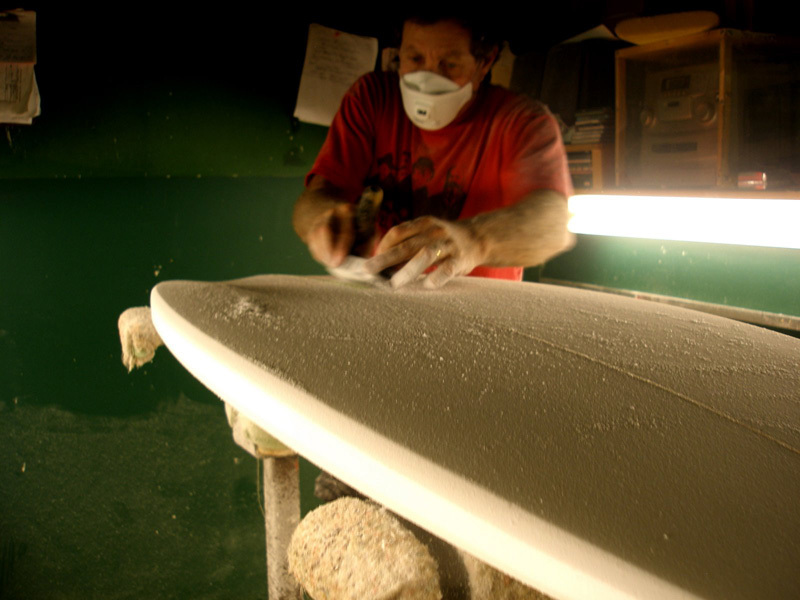 They’re different than other types of designs because there are so many variables in terms of what surfboards do. They don’t go in a straight line. They don’t have a constant external power source. You have all the lateral movement of water underneath. So, we tend to keep to basics. 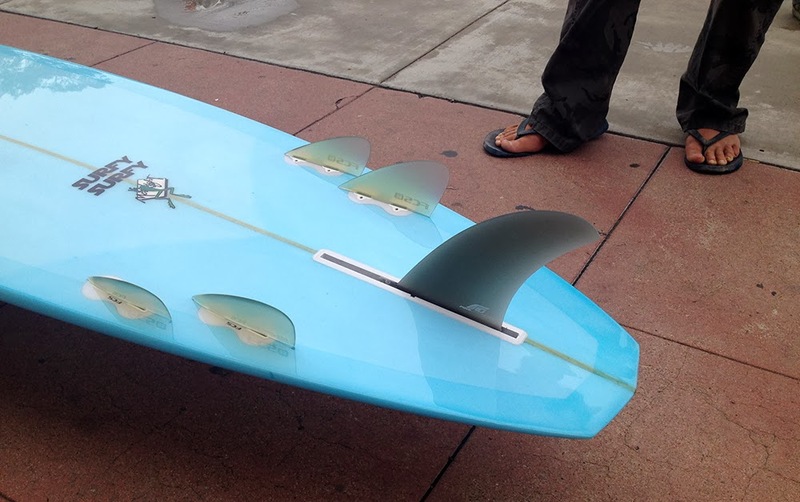 But basically, what I would say in lieu of the Venturi Principle is that the Bonzer bottom and fin system seeks to organize the water that’s flowing underneath that board and utilize the energy that comes from that more efficiently. Since most people have a Thruster as a point of reference, how would you describe the feeling of a Bonzer as compared to that? I’d say that the Bonzer is a little easier going rail to rail, cause the side fins aren’t as deep. They’ll move in and out of the water going rail to rail much easier. And you have a more refined edge control. The boards are much easier to keep on the rail through an extended bottom turn around a section or through a roundhouse cutback. Thrusters tend to want to settle back down flat 2/3 of the way through a cutback, and you can see that style of a second turn in a cutback, the guys come around, and then do that little second push to come back off the soup. 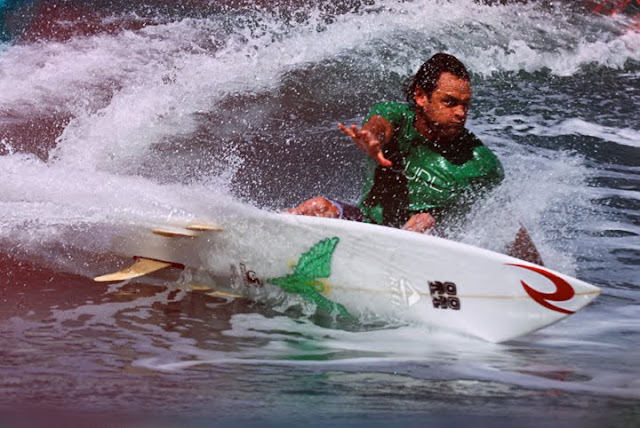 But with the Bonzer you can maintain your speed and edge control through a cutback much more easily. They carry speed through a turn and a cutback a lot more efficiently than a Thruster. If you were getting a Bonzer for the first time, should you stick to your standard Thruster dimensions? Exactly. Because that’s exactly the way we approach it. If somebody has a board they like and they’re familiar with, basically just go with the same dimensions and basically just bonzerize it. That way people can accurately assess whether the fin and bottom design in advantageous to them. And you generally go a bit bigger center fin? Our center fins range from 6, 6.5 and 7. By far the fin that’s used the most is the 6.5. It’s shocking to a lot of people at first, because it seems like such a big fin. It looks like it’s going to be stiff. They don’t look like what they surf like at first glance — it doesn’t make sense how a board can be this loose and have that much drive at the same time by looking at the fin system. It looks big, but it’s still loose. But for Taylor [Knox], even on his 6’1” he’ll use a 7” fin. And you watch him surf and you wouldn’t think there’s a deep, 7” fin in there. But he puts the pedal to the metal. Daniel [Jones] uses the 6” sometimes, but his boards are pretty small. A 5’10” that narrow, you can get away with a 6” fin. Images of Daniel Jones and his e-wing Bonzer3 from Hangs Upon Nothing, the new surf film from Jeremy Rumas. My friend Jon K, a good surfer residing on the California central coast, ordered this little Roundnose Light Vehicle Bonzer when Malcolm was on his European shaping tour. We finally got it dialed in, simple clear 4oz with Volan deck patch and classy classic glass-on side runners. The gloss and polish separates us from the animals. 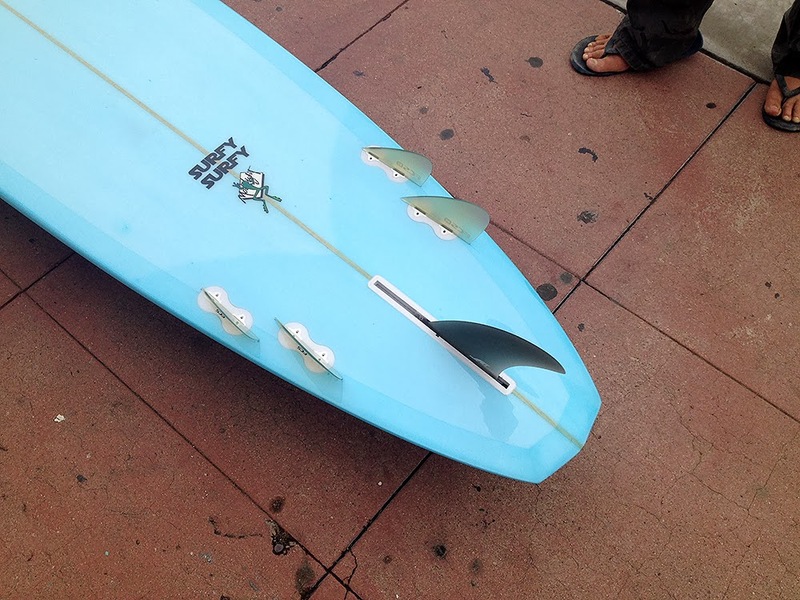 We sold a used board for Jon and he used that credit towards this new Bonzer, which is a great way to do it. Here is Jon surfing a Pavel Keel Fish a few years ago.